Fun ice creams always tease the mix-ins. I take my first bite, and yeah, it may say coffee caramel but you can still definitely taste the coffee. The good news is that it's not that strong. It's there but even a bitterness lightweight like myself can press on. I keep scooping and get to the plentiful marshmallow swirl and the occasional caramel swirl. The #funfactor starts building because it's not just gooey marshmallow, this stuff is borderline marshmallow fluff. It's puffy, fluffly, and just a joy to eat (keep in mind that I've eaten more fluffernutter sandwiches than most of the populace). Now there will always be differences from pint to pint, but mine has a ton of these fun little chocolate ampersands and they lock me in to giving a thumbs up to this flavor. 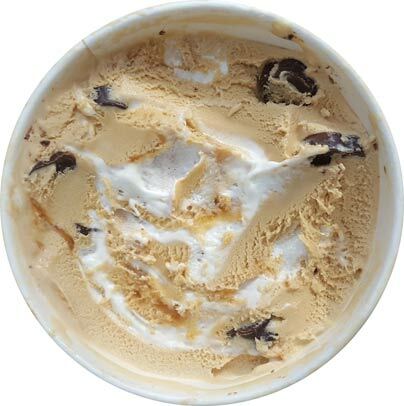 As the chocolate builds up, the coffee takes more of a back seat and you are just left with this fun ooey gooey puffy fluffy chocolate chunk scoop of afternoon snack time. Sorry, wasn't sure how to end that sentence. 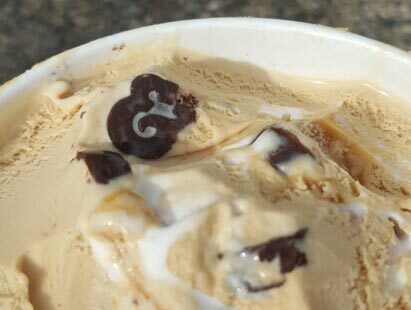 I don't like coffee ice cream but I wholeheartedly recommended giving this one a try. If you are a little skeptical, just split the pint with someone, problem solved. For everyone else, definitely give this one a shot. 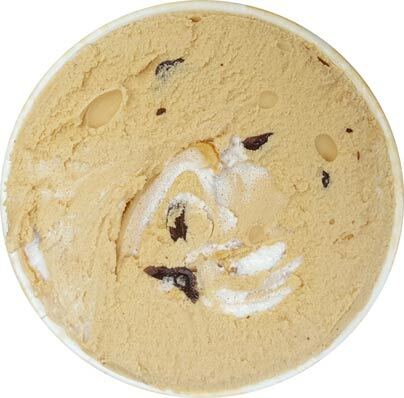 On Second Scoop: I still hate coffee ice cream but man if I don't love this foolish ice cream. My pint just has so much chocolate and marshmallow that I can't help but have fun with every bite. 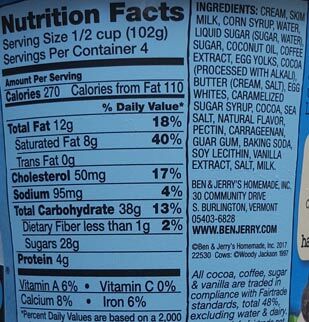 I know some will disagree, but I think Ben & Jerry's has stepped up their game this year in terms of inclusions and I'm excited for what they have in store for 2018. I’m with you on this one. I don’t like coffee - but all of the components of this pint balance it out enough that I like it. I don’t love it. I won’t buy it again. But I will enjoy finishing the pint. Purely in the interest of science, I've tried to create a flavor of cream using all my least favorite b&j's flavorings. I came up with bourbon, coconut, and banana neapolitan ice cream with coffee swirl and mint chips. @Anon: it definitely won't be a daily scoop for me either, but I just love the #funfactor here of that gooey swirl and all the chocolate. I forgot to mention that I'd be curious to see to see this combo in a caramel or toffee base too. @aol: just go every day til you find it, it sells out super quick! This isn't exclusive to any store, right? Nope, it should eventually be everywhere. Where did you find this? I've been trying to get my hands on it for the last week and am going insane slowly. Stop & Shop, but also spied at Kroger and Target. Just keep your eyes peeled and try to hit as many different grocery store chains as possible. This is somewhat a graveyard flavour resurrected, the first Dave Matthews Band collab. 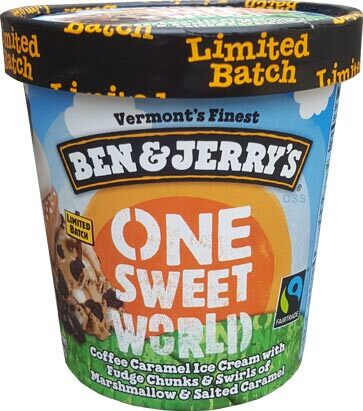 In like 2003 I was obsessed with it, and have yet to find a Ben & Jerry's pint to match it. After 15-odd years I found the experience close enough to the original, and gives hope to Ben & Jerry's fans holding out for other graveyard flavours.....but pray you don't live near me if you're keen to try this one. I'm like the Grinch nowadays! 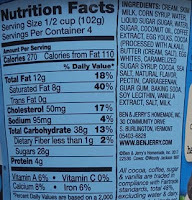 & Coffee Flavored Fudge Chips"
As much as I don't like coffee, my insides like erythritol even less (the sugar alternative in enlightened). Seems like Phish Food with a coffee caramel base instead of chocolate? Interesting! Not a coffee fan but I found this flavor tolerable due to the other components. What stands out though are the fudge chunks. I think if it were just a chocolate swirl, it'd go down better as a sort of caramel mocha frappe combo. hello! i'm not sure if you like the fudge chunks or don't like them? or do you like them but think they were the wrong choice? I just didnt think the chunks worked too well for this flavor. If it were instead a fudge or chocolate swirl, I think the flavor would have a consistent smoothness reminicent of an actual frappe. Easier to eat when melted a bit without the constant chewing. But that's just me. Hey thanks for hearing me out. Upon trying the second half of the pint, I think I am warming up to the chunks, so to speak. My husband and I ABSOLUTELY LOVE this new flavor!!! Finally found it. Was ok but just way too much marshmallow for me. If I were guessing, 1/4 to 1/3 of the pint was the marshmallow. I tease ofcourse. If you aren't a huge marshmallow person than you don't want to bother with this one.